Ellen Shattuck is an artist living and working out of Boston. Shattuck's work encapsulates the "organized chaos" of the American home. Out of this chaos there is some order. Shattuck assembles snapshots, vignettes of emotional reactions to scenarios that deviate from the ideal of domestic bliss. In her artist's statement she describes: "The obsessive thinking regarding a newborn’s eating, sleeping and breathing, and the repetition of daily routine is represented by intricate patterning and compositions that have little breathing room." 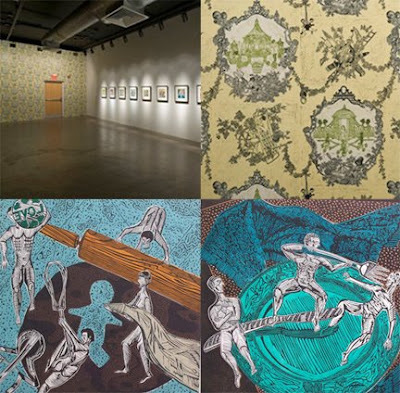 She continues regarding her process of translating these scenes into custom wallpaper: "I am drawn to the modest and traditional medium of printmaking but work to push beyond its formal boundaries. Relief carvings are the foundation of my custom wallpaper." We were fortunate enough to be able to produce Ellen's design for a custom wallpaper gallery installation. She digitally captured individual pieces, and dictated how these parts would construct the full pattern repeat. Digitally stitching together the elements for the toile and color correcting produced an outstanding result. As seen in the image above, her wallpaper is clearly the standout of the show, capturing center stage within the space. The traditional toile wallpaper pattern reveals itself as a complex network of situations upon closer inspection. Custom wallpaper gallery installations are gaining popularity. As a way to exhibit work of an artist in a format that was previously impossible before. An installation the size of Ellen's would usually represent a major challenge for many galleries, but the easy application of wallpaper circumvents traditional display anomalies and constraints. To get more info on Ellen Shattuck's work, see additional wallpaper designs, and to read the rest of her artist's statement, visit http://www.realartways.org/archive/visualArts/ellenShattuck_200805.html.